Founded in 1998, JLI's flagship program continues to operate in over 350 locations worldwide offering three accredited courses per year on an array of topics including Jewish ethics, Jewish mysticism and philosophy, Jewish history and culture, and Jewish belief and practice. JLI's courses are accredited for continuing legal and medical education and all courses offer CEU credits. Enjoy a delicious Kosher lunch while discussing the weekly Torah portion and it's relevance to our daily lives. Join Chanie for some delicious coffee and engaging girl talk. Location: Starbucks on Wildwood; near the Health and Wellness Center. 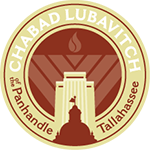 Email Chanie Oirechman: chanie@chabadtallahassee.com for more info. Soul Maps, introduces you to the Tanya, a 200-year-old text with a revolutionary new look at human psychology. It provides Kabbalah-based tools to help you understand yourself. Grab a Kosher lunch and stay to learn with Rabbi and Chanie or just shmooze. Delicious food and great company. In the student services conference room #219 every Thursdsay through Dec 6, 12:15-1:45 pm. Come to Chabad for a delicious home cooked dinner and interesting discussions. come up with any questions you want. no topic is off limits! Kuntres Umaayan, a comprehensive treatise written in the spirit and style of traditional ethical Torah teachings, touches upon the various challenges one experiences when faced with the reality of material existence obstacles that stand in the way of achieving true spiritual heights. Written in 1903 by the fifth Lubavitcher Rebbe, Rabbi Shalom DovBer Schneersohn, of blessed memory, in response to the challenges of secularism and non-Jewish ideologies that faced Russian Jewry at that time, this is a book that looks deeply into the oldest battle man against his own evil inclination. The objective of this course is to explore core elements of Jewish thought, literature and practice. Judaism spans 4000 years. You can fill up libraries with its literature. Its practices are more vast and complex than perhaps any other society. They are as vast and complex as life itself. So to think we will cover Judaism in one 8 week course is not a very Jewish thought. What we are aiming for is to explore some of its core elements; core to Judaism, and core to us—modern Jews in the 21st Century. These are issues we must be familiar with if we want to say with integrity “I am a Jew. This is not an in-depth exploration to become a scholar, get a PhD, or become “religious”. This is to have a healthy, adult-level, understanding of the core elements of our heritage and identity.